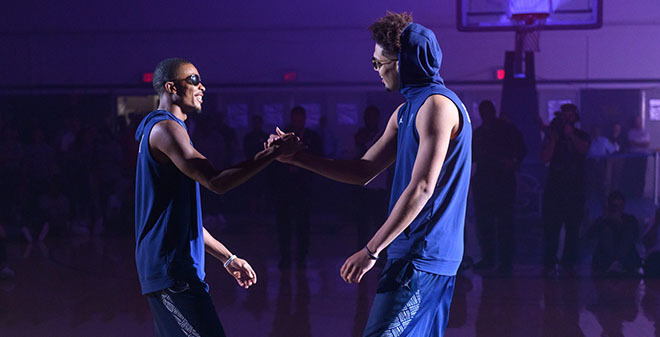 Georgetown kicked off the season with their annual Hoyas Madness show. It featured a lot of music, dancing and, yeah, some basketball. This is Patrick Ewing’s second season at the helm. The Hoyas will be looking to finish in the top half of the Big East this year. After losing Marcus Derrickson, the Hoyas scored a victory with the return of Jessie Govan. The senior big man is one of the keys when the Hoyas run pick and roll. Sophomore, JaMarko Pickett, improved as the season went on and the Hoyas have some explosive players in this year’s freshman class.